I am happy to announce the new version 1.19 of vArranger. Here are the new features list !! - NEW SFZ FORMAT SUPPORT : The vArranger Software Synthesizer can now load SFZ instrument files ! You just need to copy your .sfz files (and .wav files as they are positioned) into the SAMPLES folder, like any SF2 files. - OPTIONS / MIDIPORTS / AUDIO INPUT : NEW feature to listen in realtime (and record) the sound from the audio input of your audio card. This can be a useful to mix an external stereo synth or player or a mono microphone or a guitar with the vArranger audio engine without need of using a real hardware mixer. Just select your ASIO (preferred) or WASAPI audio input channel from the list. If you don't need the audio input, please select - None - as this will otherwise use some unnecessary resources. - OPTIONS / AUDIO INPUT : New screen that displays all the options of the audio input. * You can MUTE all the FX with one button. (Can be controlled by a MIDI controller) This is useful to remove the reverb and delay when you want to talk to the audience. * And ... the bonus ... You can also use your preferred ' Chanel Strip ' VST plugin to the audio input. 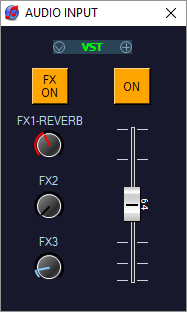 This can be a nice EQ / Compressor / Gate plugin or a guitar simulation plugin... ! 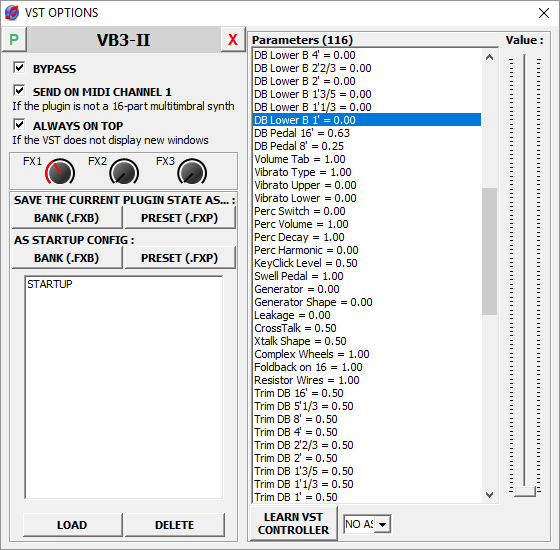 - VST instruments to VST plugins : You can now send the 16 VST instruments to the 3 vArranger FX engines, by adjusting the 3 knob level in the VST options screen. This is useful for VSTi that does not include an FX section, or if you want to use the same reverb/chorus/delay... for the vArranger Software Synth AND for the VST instruments (AND for the audio input). This can save some CPU too, not having to compute many reverbs. This file lists all the current SF2 and SFZ files and their volumes. You can change it to adjust the relative volumes between files from different sources. - New VST Intelligent CPU saver : We now bypass the VST instruments that are not currently in use in the current patch. This may results in a huge diminution of CPU usage if you load many VSTi, and remove the noises generated by some VST (like the leslie of VB3) while not currently in use. - Better VST loading / unloading : This can correct some VST plugins that had problems. - INS TRACK NAME : The name of the instruments displayed in the 16 tracks can be taken from an INS file, for every midi out. And this update is still free for all vArranger users ! ps : We are now a pretty large community of users who bought vArranger since 2009 ! And this represents a lot of efforts to offer support to everyone and continuously improve vArranger while everyone has his own configuration and expectations. I really like the idea of FREE support and FREE updates, as always since 2009, and want to continue this way as far as possible ! Since the beginning of the story, I favor the building of the vArranger community here rather than selling an update every year, like most of commercial companies does. I am happy to see that we have today more than 28000 posts in the forum ! * If you like the Update and want to contribute to the future vArranger developments, thank you very much for your donation ! Thank you very much for this update. Great enhancements. I would like to receive this new version. Sounds like a great update, cant wait to play with it. i would love to receive the new version! Thank you Dan - the new features look great. Please also send me the new Version 1.19. Many Thanks, Best Regards !! please send me the new Version 1.19. Thanks for your hard work and great release note. Good job ! Super ! V 1.19 is a great release : we get new major features which make vArranger more versatile ! Please send me the new version. Thank you Dan. I am already enjoying my favourite new feature - Auto Harmony! I would like to receive this new version. Wow Claudio ! I sent it to you on the October 12th. You seems to not received it? I just sent it to you again, with the new vArranger version 1.19.
unfortunately Scale Tuning does not work correctly. Totally wrong! with this version..
Are you using only the vArranger software synth and SF2? I use both SF2 and vSynth So far I would never have such problems with ex versions. Ps. before I have new vSynth already installed..
salut dan c vrai le réglage d'échelle ne fonctionne pas correctement. Totalement faux ! Dan, merci de m'adresser la nouvelle version ! Dan, would you please send me the new version. Merci de m'envoyer la nouvelle version 1.19... et merci pour tout ton boulot! Good Morning Gentleman, will you please send me the link t download the new version? Please download and install the vArrangerSynth again. It should be working again. can i have the new version? I have heard thats New Version 1.19.01 ? Or is it the same You send to me ? Dedadavor you should already have the v1.19.01, right? Claudio, can you download and install the vArrangerSynth again ? It will correct the ARABIC SCALE and the arithmetic error on 32 Bit systems. Hi Dan, can i have this update? Thanks..
Would luv the update please. Finally getting all my stuff unpacked again. Hi Dan. Can you please send me the new version? Could you send this new version 1.19 of the va2? Andrew, you already received it, to your email you have registered on the forum. No? Please send me the latest update and procedure. I got my VA on a USB stick. please send me the newest Version 1.19. Thanks for the update link. Which one is needed to install first, the vArrangerSynth.exe or vArranger2.exe? Could you send a copy of the new version to me please? Géniale cette version Dan , l’enregistrement audio est vraiment un must; bravo pour ton travail et merci de faire évoluer ce fantastique logiciel . Dan can you please send me the latest update? Merci d'avance and keep on "developping!" Well done on the next step..
Can you please send me the new version..
Merci DAN pour cet update dont il me tarde d'essayer les nouvelles fonctionnalités. Merci de m'envoyer la version 1.19. Thanks for the continuing support for vArranger. I would like to try the new version 1.19. Salut Dan, merci de m'envoyer cette nouvelle mouture. Avec la lecture des cdg...ce serait encore mieux...!!! Halo Dan. Please send to new version 1.19. Thx. May I have this last version too, Dan? Could you please send me version 1.19. You already have it. No? The version I am running is 1.18 I am afraid that I have not received 1.19. I sent it to you on October 24th to your email address that you have set on the forum. Can you send 1.19 to me please? It would not be bad if possible for you to include Panorama in Audio In. I have not found. Were also not synonymous noc an audio Imput 2. I need an input for accordion and one for vocal. Pan controller will not be bad either. Vocal is also mono. I did not understand you what you mean. I need 2 microphones to use. One for Vocal and one for Acoustic Accordion to record. I think we do not quite understand each other. I meant when I use two mikrofphone separately. One for vocal and another for accordion and both of them liked to record mono. Vocal I want to have in the mite and Akkordion right for example. I would like the new version please. Version 1.19 is ready to download! I have still version 1.18! Could you provide me the download link for the new Version! Thank you! Appreciate your work very much! Please send me latest version. Pourrais-tu m'envoyer la version 1.19 ? Les contrôleurs VST contrôlent automatiquement l’instrument VST actuellement affiché à l’écran. Et en cas de changement de VST pas de problème ça fonctionne bien avec le canal droit mais pas avec le canal gauche utilisation de deux claviers. Could you please send me the new version. hello dan where can I download the latest version? Also please send me the newest version of Varranger. Can you send me the latest update please. Can you send a copy to me as well please. Could you send me this new version? Please send me the new Version 1.19 VA.
is the 19.01 the newst ? when new please send me. Oui, j'aimerais avoir cette nouvelle version SVP. May I ask how to see what version am running,.